Where will the 2019 Affiliations Conference be held? All conference sessions, breakfasts, and the Resource Fair for the 2019 Smithsonian Affiliations Conference will take place at the Hilton Washington DC National Mall. Reserve a room here. Attendees are encouraged to reserve a room at this hotel. Transportation for all events will only take place from the conference hotel. Behind-the-scenes tours and some receptions will take place at Smithsonian museums or other venues on Capitol Hill. How are sessions and workshops for the Smithsonian Affiliations conference developed and planned? For 2019, Affiliate and Smithsonian colleagues are invited to submit session proposals. Please click here to review proposal guidelines and to submit a session idea. In addition to submitted proposals, Affiliations staff reviews all topic suggestions made by Affiliates through conversations with their National Outreach Managers and the previous years’ conference evaluation forms to make sure a robust and informative conference is developed. What are some highlights of the annual conference? Behind-the-scenes tours of the Smithsonian collections are always a highlight for conference participants. Previous tours have included an in-depth look at exhibition fabrication and design at Smithsonian Exhibits, an inside-look at conservation methods at the Museum Conservation Institute, the storage collections of the National Museum of the American Indian, and the Garber Restoration Facility of the National Air and Space Museum. Extended workshops focusing on new programs or new ways to engage with museum audiences are typically offered. Attendees have learned about early education with the Smithsonian Early Enrichment Center, curating educational collections for school curriculum with the Smithsonian Center for Learning and Digital Access, and editing Wikipedia articles with the Smithsonian Institution Archives. Smithsonian Affiliations is one of the only offices at the Institution which organizes a networking opportunity on Capitol Hill. Each year, a location either on Capitol Hill or in close proximity to the Capitol is selected for a reception in honor of Affiliates and their congressional representatives. All members of Congress representing Affiliate states and districts are extended an invitation from the Secretary of the Smithsonian to come and meet their Affiliate constituents. Conference week at the Smithsonian offers Affiliates the opportunity to schedule one-on-one meetings with Smithsonian experts to discuss artifact and object loans, programming opportunities and educational workshops. It is also a chance to meet Smithsonian staff and forge new relationships. Affiliates are encouraged to send a representative or representatives to the annual meeting each year. May I attend if I am not currently a staff member at an Affiliate organization? No. The Smithsonian Affiliations National Conference is for current Affiliates and Smithsonian staff only. If you are interested in becoming an Affiliate, or have an application in progress and would like to attend the Conference, please contact Elizabeth Bugbee for more information. What is included in registration cost? 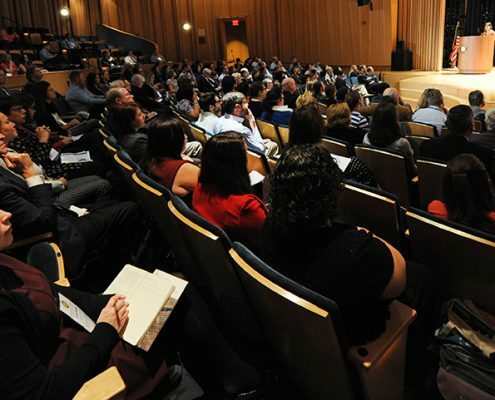 The conference registration fee entitles you to full access to the conference, including the Smithsonian Resource Fair, the keynote, the general sessions, and behind-the-scenes tours (pre-registration for tours may be required). All registrants will also receive a conference program and registration materials on-site. Some meals and special events may not be included. What is the registration refund policy? If a registrant is unable to attend for any reason, they may substitute someone else to attend in their place. Cancellation requests received before June 1, 2019, will receive a full refund. No refunds will be granted after June 1. All requests must be made in writing via email to affiliates@si.edu. Smithsonian Affiliations is able to offer a small number of scholarships to help support Affiliates’ attendance at the 2019 Smithsonian Affiliations National Conference. Registration fees* for scholarship recipients will be waived; scholarship funds may be used for travel, lodging, and other associated costs. The applicant must be at an Affiliate organization in good standing and demonstrate that they would not be able to attend the conference without support. 2019 Scholarship program is closed. All applicants will be notified of the status of their request by April 26. Awardees will be required to complete additional paperwork to receive scholarship funds. How your participation in the conference will contribute to the conversation around the conference theme, Leveraging Partnerships and Collaborating More Effectively. How your participation in the conference will contribute to your professional growth. How you plan to apply knowledge from the conference to your work. The amount of your scholarship request, including a budget to show how resources will be allocated. Please include in the budget any resources your institution will contribute to your attendance. Requests may not exceed $1,000. *this includes registration for the awardee only. Any guest fees for special events will be the responsibility of the awardee. May I bring a guest to evening events and tours? Registered Affiliate attendees may bring additional guests (up to two additional guests) to evening events, however, additional fees may apply. Guests of registered attendees may not sign up for behind-the-scenes tours. Conference attire is business casual. Some evening events and events on Capitol Hill may require business attire. While shuttle service may be provided for some events taking place outside of the hotel, be certain to wear comfortable shoes for walking during any tours or free time. Please make certain you are signed up to receive eAlerts from Smithsonian Affiliations to be kept aware of conference activities. Sign up here. Is there anything specifically directed towards first-time attendees? If it’s your first time attending the Conference or you are a new Affiliate colleague, the Orientation session and Welcome Reception are for you. This is your opportunity to meet with fellow Affiliate members as well as Smithsonian staff who can provide insight to the benefits of your Affiliation. First timers, please let us know it’s your first Affiliations Conference when we meet you! Have more questions? The Smithsonian Affiliations staff is happy to answer your questions, hear your concerns, and brainstorm with you about the National Conference. Contact us!